This assessment is a fundamental component of the Central Hardwoods Climate Change Response Framework project. The Framework is a collaborative, cross-boundary approach among scientists, managers, and landowners to incorporate climate change considerations into natural resource management. 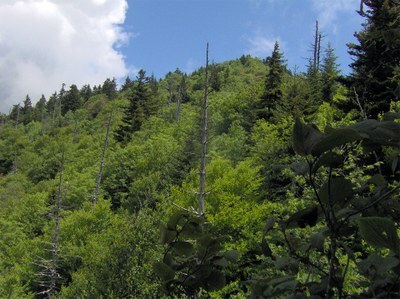 Three ecoregional Framework projects are underway, covering 132 million acres in the northeastern quarter of the United States: Northwoods, Central Appalachians, and Central Hardwoods. Each regional project interweaves four components: science and management partnerships, vulnerability assessments, adaptation resources, and demonstration projects. We designed this assessment to be a synthesis of the best available scientific information. Its primary goal is to inform those who work, study, recreate, and care about the ecosystems in the Central Hardwoods Region. As new scientific information arises, we will develop future versions to reflect that acquired knowledge and understanding. Most important, this assessment does not make recommendations about how this information should be used. The scope of the assessment is terrestrial ecosystems, with a particular focus on tree species. Model projections in the region to date have focused primarily on the direct impacts of temperature and precipitation on tree species. We anticipate future modeling will incorporate the interactions between these direct impacts and disturbances such as insect outbreaks, invasive species, and wildfire. Climate change will also have impacts on aquatic systems, wildlife, and human systems, but addressing these issues in depth is beyond the scope of this assessment. The forests in the Central Hardwoods Region will be affected directly and indirectly by a changing climate over the next 100 years. This assessment evaluates the vulnerability of terrestrial ecosystems in the Central Hardwoods Region of Illinois, Indiana, and Missouri to a range of future climates. We synthesized and summarized information on the contemporary landscape, provided information on past climate trends, and illustrated a range of projected future climates. This information was used to parameterize and contextualize multiple vegetation impact models, which provided a range of potential vegetative responses to climate. Finally, we brought these results before a multidisciplinary panel of scientists and land managers to assess ecosystems through a formal consensus-based expert elicitation process. The summary of the contemporary landscape identifies major stressors currently threatening forests and other terrestrial ecosystems in the region. Major current threats to forests in the area include invasive species, habitat fragmentation, oak decline, and a decrease in fire in fire-adapted systems. Observed trends in climate over the historical record reveal that precipitation increased in the area, and that daily maximum temperatures decreased while minimum temperatures increased. Climate trends projected for the next 100 years by using downscaled global climate model data indicate a potential increase in mean annual temperature of 2 to 7 °F for this region. Projections for precipitation show an increase in winter and spring precipitation; summer and fall precipitation projections differ by model. We identified potential impacts on forests by incorporating these climate projections into three forest impact models (Tree Atlas, LINKAGES, and LANDIS PRO). Model projections suggest that northern mesic species such as sugar maple, American beech, and white ash may fare worse under future compared to current climate conditions, but other species such as post oak and shortleaf and loblolly pine may benefit from projected changes in climate. Changes in northern red, scarlet, and black oak differ by climate model. We assessed ecosystem vulnerability for nine natural community types in the region by using these model results along with projected changes in other factors such as wildfire, invasive species, and diseases. The basic assessment was conducted through a formal elicitation process of 20 science and management experts from across the region, who considered vulnerability in terms of potential impacts on a system and the adaptive capacity of the system. Mesic upland forests were determined to be the most vulnerable, whereas many systems adapted to fire and drought, such as open woodlands, savannas, and glades, were perceived as less vulnerable to projected changes in climate. These projected changes in climate and the associated impacts and vulnerabilities will have important implications for economically important timber species, forest-dependent wildlife and plants, recreation, and long-range planning. Brandt, L., H. He, L. Iverson, F. R. Thompson, III, P. Butler, S. Handler, M. Janowiak, P. D. Shannon, C. Swanston, M. Albrecht, R. Blume-Weaver, P. Deizman, J. DePuy, W. D. Dijak, G. Dinkel, S. Fei, D. T. Jones-Farrand, M. Leahy, S. Matthews, P. Nelson, B. Oberle, J. Perez, M. Peters, A. Prasad, J. E. Schneiderman, J. Shuey, A. B. Smith, C. Studyvin, J. M. Tirpak, J. W. Walk, W. J. Wang, L. Watts, D. Weigel, and S. Westin. 2014. Central Hardwoods ecosystem vulnerability assessment and synthesis: a report from the Central Hardwoods Climate Change Response Framework project. Gen. Tech. Rep. NRS-124., U.S. Department of Agriculture, Forest Service, Northern Research Station, Newtown Square, PA.